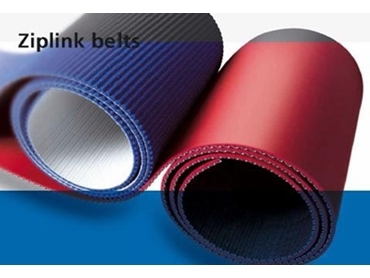 ZipLink available from Rydell Industrial (Belting) Co is an innovative belt range specially designed to offer users an outstanding range of product benefits in a variety of different industries. It can be installed or replaced quickly and simply, helping to lower costs and reduce downtime. It also has a more flexible design, which allows for the repair or replacement of just small sections of the belt. ZipLink keeps the same resistance over the entire length of the belt leading to much smoother operation. It can protect both the product and the conveyor itself from being damaged. The safe temperature operating range has been extended from -54°C right up to +176°C. ZipLink has been specially engineered to make installation, usage and maintenance as straightforward as possible. It can be quickly and easily spliced without the need for any special tools or presses. There is no loss of strength in the splice area and it has a very low stretch polyester monofilament carcass. What’s more, the extra high lateral stability makes tracking considerably easier. ZipLink is troughable and the wide selection of top covers available means it can provide solutions for an extensive range of applications. It’s ideal for cardboard manufacture applications encompassing box folding, stacking and conveying. Wood processing, grinding, sanding, polishing, braking, sawing, painting and pre-compressing are some of the other applications. It can be used for the grinding and sanding of metal, for scanning, check-in, collecting and aircraft loading for airport applications, as well as for conditioning, weighing and conveying of tobacco. ZipLink is also an excellent choice for metal detectors, panel boards and in the agricultural industry. Finally, ZipLink gives you a choice of top cover materials. These include oil and grease resistant Nitrile rubber for use in high temperature, abrasion resistant Nitrile carboxylated BX, natural rubber to withstand high levels of friction, UV and wear resistant SBR, anti-adhesive silicone for use in both low and high temperature, anti-adhesive Peflex, which is oil resistant, food grade and can be used at low temperature, low cost Flexam, oil and grease resistant, food grade Nonex, high friction Pletex and abrasion, oil and grease resistant Elastoflex, and cotton fabric for sticky applications.